The Sovereign Art Foundation’s portfolio of international projects includes art empowerment programs geared towards Vietnam’s most vulnerable children, a music and arts programme for orphaned or abandoned children in Mongolia’s capital, creative arts healing projects for victims of human trafficking in Cambodia and a youth-lead pilot project in rural Nepal designed to raise awareness of children’s rights. Children serviced by these programmes are victims of poverty, human trafficking, child labour, drug use or physical abuse. Expressive arts are used to rehabilitate children, build self-confidence and encourage them to return to education. We currently fund arts programmes for children in four key locations around Asia. Click on each location to see the name of our charity partners. M’Lop Tapang is a non-profit organisation that has been working with the street children of Sihanoukville, Cambodia since 2003. 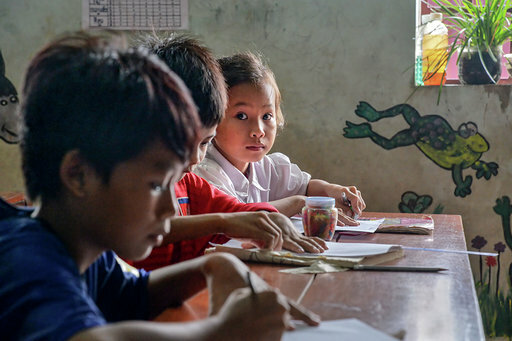 It works in the Sihanoukville area to provide street children access to the learning tools, resources, and opportunities they need to build a better future. It offers regular meals, shelter, medical care, sports and arts, education, training and protection from all types of abuse. The Sovereign Art Foundation partners with M’Lop Tapang to give thousands of Cambodian children and youth the opportunity to try something new and to cultivate their own unique talents. Through programs that include dance, music, acrobatic and circus acts, as well as painting and drawing classes, these children have the chance to express themselves creatively. Read more about M’Lop Tapang. The Child Welfare Scheme (CWS) is a charity committed to bringing change to the lives of the most disadvantaged children and their families through protection, education and healthcare. CWS works in Nepal and addresses big issues through grassroots, low-cost, replicable and sustainable solutions. The Sovereign Art Foundation supports CWS to provide art to the children of remote villages in Nepal. Through its partner Child Welfare Scheme Nepal (CWSN), CWS supports children in remote villages; providing Early Childhood Care and Education (ECCE) to children aged 2 to 5. Previously, these centres lacked both art supplies and facilitators with the knowledge of how to stimulate children’s creativity through art specifically. The children benefit from SAF-donated art supplies and activities, and facilitators who have the opportunity to receive art training in techniques teach them. The Christina Noble Children’s Foundation (CNCF) is an international partnership of people dedicated to helping underprivileged children and those at-risk of commercial or sexual exploitation. Its operational centres in Mongolia and Vietnam provide shelter to underprivileged, orphaned or abandoned children whilst ensuring all children in its care have direct access to a good education, a high standard of healthcare, and other social and employment opportunities. They also engage in sustainable development initiatives that directly benefit the families and wider communities of the children they support. 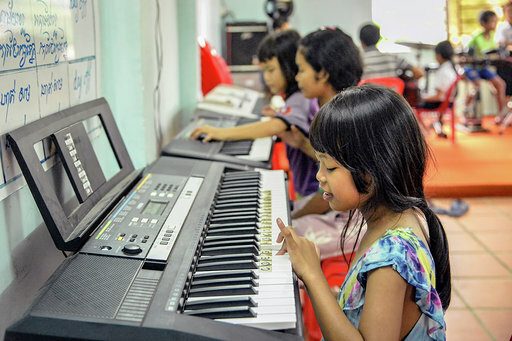 The Sovereign Art Foundation supports the CNCF Vietnam Music & Art Education Programme, a programme that gives children living in desperate poverty the chance to express themselves creatively and achieve their potential through interests outside of schooling such as art, dance, singing & drama. HAGAR is a global organization that operates commercial and non-profit entities in pursuit of its mission – to restore to wholeness the lives of women and children in Afghanistan, Cambodia and Vietnam who have experienced extreme human rights abuse. Hagar is committed to the recovery of the whole person: ‘whatever it takes, for as long as it takes to restore a broken life’. The aim of Hagar’s Creative Arts Program is to develop a wide range of activities that are fun and recreational, and to provide a space where clients can come and just be children, to play, and perhaps discover something they really like doing. Hagar’s Creative Arts Project is based on art therapy – the underlying theory that creative activity is beneficial in and of itself. In 2014 and 2015 The Sovereign Art Foundation funded art workshops in Phnom Penh, in cooperation with Hagar Hong Kong. The Sovereign Art Foundation sent Hong Kong-based artists, Marc Standing and Tanya Bennett, who traveled to Hagar to teach art workshops for child clients involved in Hagar Cambodia’s Creative Arts Program. In 2014, The Sovereign Art Foundation supported the Colombo Biennale and the Mullegama Art Centre of Sri Lanka by sponsoring a series of Biennale art workshops. The workshops were run by Sri Lankan artist and Sovereign Asian Art Prize 2010 winner, Pala Pothupitiya, and six artists associated with the Mullegama Art Centre. The workshops, which were held over two consecutive weekends, attracted twenty-six participants including students from private International and government village schools, and an orphanage as well as the Mullegama Art Center, a total of 9 organizations. The coordinator for the workshop, Lalith Manage, a teacher at the City School of Architecture in Colombo and the curatorial coordinator for CAB 2014, planned the workshop and design the activity programs with Pala Pothupitiye. In this workshop, students looked at conceptual thinking of transition from 2D to 3D, via the design and production of soft sculpture. The five sculpture artworks students created were then exhibited prominently at the Goethe Institut Hall at Colombo, during the 2014 Colombo Art Biennale. The Royal Charity Organization was established by M King Hamad Bin Isa Al Khalifa on July, 14, 2001 for the purpose of caring for Bahraini orphans. In November, 4, 2001, another Royal Decree was issued by HM for the organization to begin providing care for widows. The missions of the Royal Charity Organization are; to sponsor widows and orphans and care for the elderly and those with special needs; to provide social, health and educational care, and help mitigate the cost of living for needy families. To contribute in setting up and developing social and charity projects, such as orphanages, child care and disabled centres, centres for the elderly, kindergartens, rehabilitation for families in need, and health rehabilitation centres; and to contribute to sustainable long-term development.